Last weekend we went to Florida to visit my father in law. He is 95 years young and wanted to go on a vacation. We found a hotel on the beach in Fort Lauderdale about 45 minutes from where he lives. Our rooms overlooked the ocean, and with the balcony door open we felt as if we were in the ocean. My father in law does not get around as easily as he once did, so a lot of our time was spent hanging out in the room. I don't hang out so well without something to do. I came prepared with books in hand. I finally finished Catching Fire which I enjoyed, but it was not as awesome as Graceling which was one of my top reads for last year. 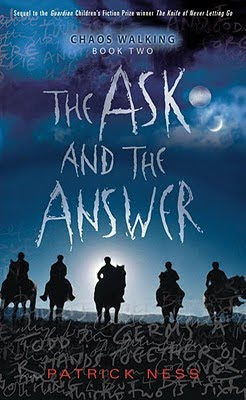 I was anxious to begin The Ask and the Answer because the first in the Chaos Walking series, Knife of Never Letting Go, left the reader with a total cliff hanger. In this second installment Todd and Viola are rarely in each other's company. There are a lots of situations of who is on who's side and also questions about who really is the evil force in town. There are many chase scenes, too. Generally, this is the type of book that I dislike, but the characters are compelling. The idea of this future that is part primitive, part advanced with medical treatments that are beyond our imaginations pulls me into a story that I would normally avoid. Todd and Viola are very likeable characters. Though I hope the third in the series will explain some of the characters' motivations for choosing sides. I think that I have a year to wait to find out all the answers.